England boss says national-team role is "an honour to be in... I thoroughly enjoy it"
England boss Gareth Southgate has played down suggestions he might return to club management, amid reports he is on the shortlist for the Manchester United job. 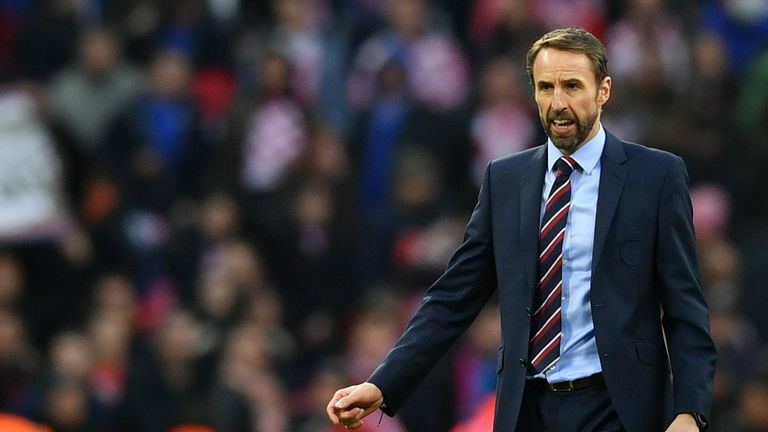 Having led England to the World Cup semi-finals in Russia last summer, Southgate signed a contract extension with the FA in October which will keep him in his current job until after the 2022 World Cup. But reports emerged recently stating that Southgate was on a shortlist drawn up by United chiefs as they contemplate a permanent replacement for sacked former boss Jose Mourinho. However, Southgate told Sky Sports News: "I'm the England manager and it's a privileged position to be in. "We've had the best year for 28 years and we've got a [Nations League] semi-final this summer and a European Championship [in 2020] that's predominantly at Wembley, providing we take care of business to qualify. "I think there is a lot of importance in life about enjoying what you are doing. "I am still a young coach, I've managed less than 200 matches, so, for me, it's an honour to be in the role I'm in and I thoroughly enjoy it." Southgate spoke to SSN at a Football Writers' Association dinner in London on Sunday, staged in honour of Southgate, his England squad and staff. The manager added: "When you're having tributes, you're thinking, 'Well, the job is not done for us yet, there's a lot for us to go for and a lot of improvement for us to make'."